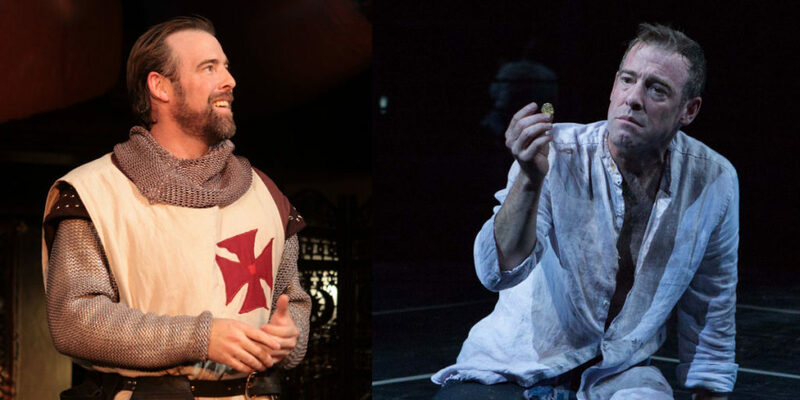 Ian Merrill Peakes as Iago in Othello (2011) and as Timon in Timon of Athens (2017). Photos: Carol Pratt and Teresa Wood. Iago and Timon. One betrays the man who considers him his closest friend. The other turns his back on his nation, his place in society, and all mankind. What are the points of connection between these Shakespeare characters? At a recent Folger Friday event, two actors offered insights from their experiences performing in Folger Theatre productions of Othello and Timon of Athens. Ian Merrill Peakes has played Iago in Othello and Timon in Timon of Athens, and Louis Butelli has played Roderigo in Othello and Ventidius in Timon of Athens. Ian Merrill Peakes as Timon of Athens. Folger Theatre, 2017. Photo by Teresa Wood. Louis Butelli as Ventidius in Timon of Athens. Folger Theatre, 2017. Photo by Teresa Wood. Louis Butelli as Roderigo and Ian Merrill Peakes as Iago in Othello, Folger Theatre, 2011. Photo by Carol Pratt. There’s a little mystery behind Iago’s malice towards Othello, Peakes says. Iago’s heard rumors that Othello has been in bed with his wife, but admits that he doesn’t know if they’re true. In contrast, “We get to see more of why Timon becomes a misanthrope, because of the betrayal of his friends,” Peakes says. The people he thought were his true friends only cared about his money. “Timon felt he had personal bonds, and then by being betrayed in that regard, becomes a betrayer of his entire city-state,” Butelli says. When Timon later finds gold, he gives it to soldiers who are marching against Athens. One of Shakespeare’s “great tropes and tricks” is to have his villains address the audience directly, to say all the very bad things that they’re about to do, Butelli says. Iago does this, but Timon doesn’t. Timon of Athens: A true villain? Timon of Athens, directed by Robert Richmond, is onstage through Jun 11. Esther French is Digital Managing Editor at the Folger Shakespeare Library. She manages the day-to-day operations of the Shakespeare & Beyond blog.